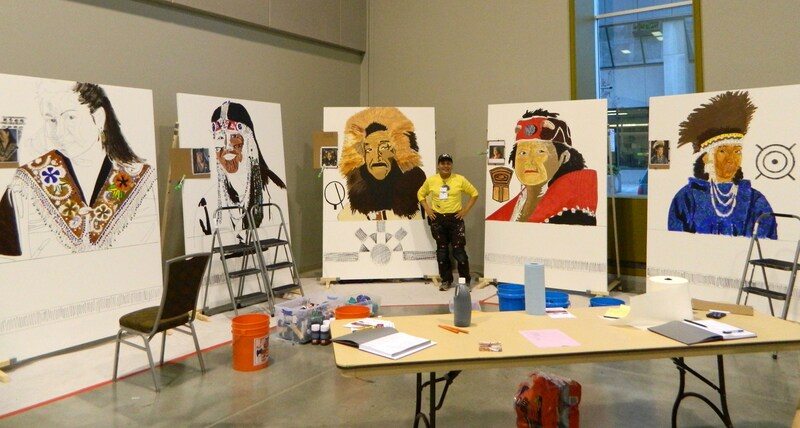 Artist Phillip John Aarnaquq Charette lead a community mural project at the First Alaskans Institute Elders & Youth Conference at the Dena’ina Center in Anchorage. People were welcomed to help paint the mural with Phillip. People painted for as little or long as they wanted to. Phillip said it is about 300 feet of canvas and the biggest painting project he has ever worked on. Putting the canvases together was a challenge because of bent wood and the immense size. It is a project of the Alaska Native Heritage Center. 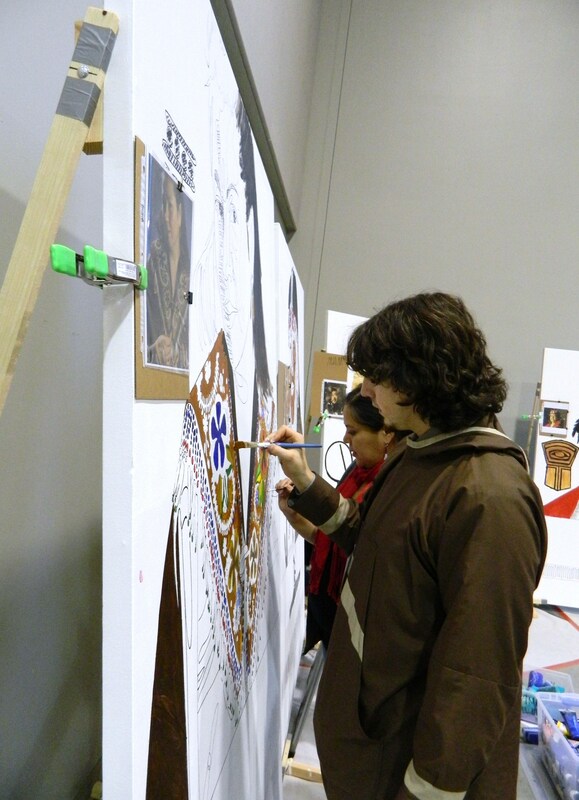 The murals are now on display at the Ted Stevens International Airport. The images are from pictures from Alaska Native people from different regions or tribes across Alaska. View the Alaska Native Heritage website at http://www.alaskanative.net/ to see the photos on the top portion of their website. The images tie in with each of exhibits representing Athabascan, Yup’ik & Cup’ik, Inupiaq/St. Lawrence Island Yupik, Unangax & Alutiiq/Supiaq, and Haida/Tsimshian/Eyak/Tlingit. Alaska Native values will also be listed on each piece to tie them together. The Alaska Native Heritage Center logo in the center also will help tie them together. It was great to see people painting. You don’t have to be a painter to participate. Phillip is there to give instructions. The public is welcome to come and check it out too! There is a positive vibe to it all. Thank you so much for printing this out. It was something that was great for the community as a whole.